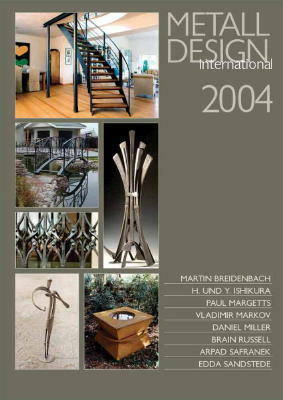 Because the media claims the blacksmithing trade is dead, the 2004 yearbook presents more forge-work and less metal design. However, the economic upturn in Europe still has to be nurtured, so that no boom into for-work can be felt. The art of forging has always been rather popular in the United States and the United Kingdom. Brian Russell and Paul Margetts represent the British line while in Daniel Miller they present an American who can be considered a philosopher on the anvil without reservations. Although not conservative he is highly interesting in his versatility and the use of shapes. A young blacksmith Martin Breidenbach represents Bavaria and Edda Sandstede, the first German woman on the anvil represents northern German blacksmiths. This year once again shows that two hundred pages is not nearly enough to show the large variety and creativity of the international scene as a whole.